We, Micky Munns and Michael Fineman, are youth athletes with dreams of competing in the Olympic games. Before that is possible, we must compete in major international regattas in the International 420 (I-420) to qualify for the US Sailing Team. We have already represented the US once at the 2018 World Championship, and are training to qualify for 2019 Worlds and Jr Europeans in Portugal and Spain, respectively. We have accomplished this lofty goal through a combination of our hard work, commitment, experience, and racing skill. We are accomplished racing sailors, and we organize and manage everything ourselves. Thank you to everyone that helped us get to Miami -- we will keep you updated on what we are doing next. This school year, we plan to return to earn the point necessary to qualify for 2019 Worlds and Jr Europeans. Sponsorship opportunities are available: we have advertising space on our boom and hull. While larger donations are appreciated, any contribution helps. We would also appreciate assistance including donations, hotel vouchers, and frequent flier miles. Time is short (to help get the word out, share our link to your Facebook Timeline). Micky Munns was born in 2001 and raised in Redondo Beach, CA. He began sailing US Sabots and Optimist Dinghies at age 7. His passion for racing ignited when he joined the King Harbor Youth Foundation FJ Race Team at age 13. Micky became the most hardworking member of his team, and racing success followed. At age 14, Micky decided to dedicate his life to an Olympic 470 campaign. Traveling across the state, Micky competed in every local and regional regatta. Eventually, Micky became one of the premier sailors in southern California. He ended the FJ-only portion of his career with a dominant 7-point victory at Area J Junior Olympics. Later that summer, he competed in his first C420 regatta, Buzzards Bay. Micky decided to compete in the Club and International 420, but struggled to find a boat. Although he couldn’t afford to purchase a boat outright, he was able to join the Del Rey Yacht Club C420 team. Micky recruited his good friend and fellow KHYF skipper, Michael Fineman, to be his crew. 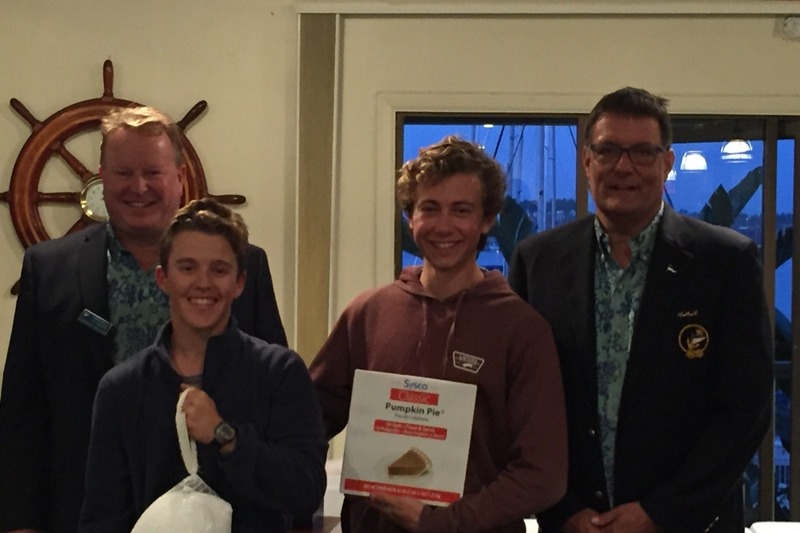 After only two months of training, the new team placed 4th at I-420 Pacific Coast Championships (PCCs) and 4th in the Southern California Youth Yacht Racing Association (SCYYRA) clinic regatta in C420s. After proving they had the skill and work ethic to be competitive in both classes, they trained harder than ever. They set their goal in the class for I-420 World Championships 2018 in Newport, Rhode Island. Both athletes believed they could achieve this goal, and they began a campaign to raise the necessary funds. Micky is a senior at Redondo Union High School and shoulders a challenging academic workload including three Advanced Placement courses. An academic letterman at RUHS, Micky applies his characteristic work ethic to his schoolwork with hopes of attending Brown University and competing on their sailing team. Academic success is important to Micky and he often completes homework on planes, car rides, and evenings to ensure that he maintains high marks while remaining one of the premier sailors in the country. Micky primarily trains in the I420. While some Tuesdays and Thursdays are dedicated to high school practice at KHYF, most are spent honing skills in the I420. Weekends are spent either competing or training in the 420, and additional weekdays are also spent training or working out. However, Micky still attends every dinghy regatta he can, no matter how small, believing that any opportunity to start races can improve his sailing. Micky has attained success because competitive sailing is his life’s passion. His accomplishments thus far are nothing compared to those that lie ahead. Michael Fineman was born in 2002 and raised in Hermosa Beach, CA. He began sailing US Sabots and Optimist Dinghies when he was 7 years old, and competed in many Optimist regattas. Michael learned how to successfully race a sailboat. He grew his passion for the sport especially after joining the DRYC sailing program..
At 13, Michael joined the King Harbor Youth Foundation FJ race team. As a talented 8th grader, Michael qualified to represent Redondo Union High School. He practiced skippering and crewing throughout the season, becoming a versatile and valuable member of the team. He sailed in every regatta and with every person possible. In his very first FJ Regatta, Michael finished in 8th place, however, by the end of the season, he had won the SoCal series! Recognizing that improvement is made through hard work, Michael dedicated countless hours to mastering his craft. To continue his rapid improvement, Michael crewed on keelboats and spent the summer 2017 sailing on many classes of boats. His hard work continued to pay off: in September 2017, Michael began his first year at Redondo Union High School. As a freshman he became a full-time FJ skipper for his school. 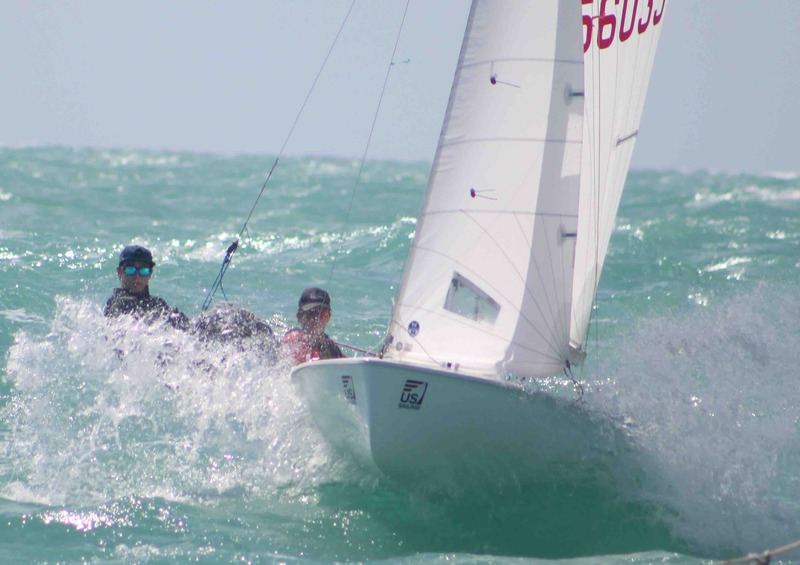 Michael sails in talented fleets and multiple race series representing RUHS, DRYC and KHYC. He achieves encouraging results, and constantly continues to improve his skills. Michael’s drive to improve led him to join his good friend and teammate Micky Munns in C-420s and I-420s. Months of training have yielded impressive results. Both sailors believe they are ready to attend a major regatta, and are campaigning for I-420 Worlds in Newport, RI. Michael is a hardworking student. As a freshman, he participates in challenging honors courses and maintains a high GPA. In his first year of high school, Michael has made large leaps in his sailing while still earning high marks. Michael also recently received certification in CPR, First Aid, and the Automated External Defibrillator (AED). Michael currently spends his free time competing in regattas, attending high school practice at KHYC, attending C-420 practice at DRYC, and training in i-420s at SDYC. While this makes for a hectic and challenging schedule, Michael believes it will ultimately help him possess elite sailing talent. Although only a freshman, he has already achieved more than many older sailors. Continuing of this path, Michael will reach his goal: to become one of the best sailors in the country. We kicked off our Thanksgiving break last weekend with a victory at the I-420 Pacific Coast Championship in Long Beach, CA. While we competed in a much smaller fleet than at ACCs, we were proud of our performance in our sole west coast I-420 regatta. We feel that we are right on track for the rest of our Worlds campaign for 2019. Taking advantage of a day off of school on Monday, we hauled our west coast boat down to Alamitos Bay Yacht Club. We spent the day training in an 18+ knot southerly -- probably the result of a strong Santa Ana that weekend. Throughout the week, we practiced on the course area, acclimating ourselves to the reliable Long Beach breeze. We finished off our preparation with a day of polishing and other small boat work jobs. Saturday was raced in a fickle 5-8 knot southwesterly sea breeze. We raced to the south of the Long Beach breakwater on a course with Lasers, Radials, and Finns. This regatta doubled as the Turkey Day Regatta, so we were sharing our course with several other classes, each competing in their own championships. Although we struggled downwind, we were able to win the three races of the day. Our upwind speed and good boathandling helped us to maintain a strong lead over the fleet. Sunday brought a slightly stronger breeze. We began to sail higher angles in the lighter air, and work down with speed instead of power. We managed to win the first race, but we failed to defend the right side of the course on the last two races, leading to two seconds to end the regatta. We also were unable to sail as high as we needed to in order to hold our lane. While we ended the regatta 1-1-1-1-2-2, we understand that more work is necessary to continue our progress. Our first anniversary of I-420 sailing was a successful one. However, we still have plenty of progress to make. We need to improve our high mode and our lighter air low mode. We will continue to work hard to improve our sailing and our results. We our both pleased with our progress and driven to work hard. Our next two events are the SCYYRA clinic in the C420, where I will be honored as part of the SCYYRA team (top sailors in SoCal), and a local Perry series C420 regatta. We will end our year of competition at Open Orange Bowl in Miami, FL -- a Worlds qualifying I-420 regatta. We would also like to thank all our donors and supporters for their financial support and their encouragement. We appreciate any support that you would be willing to give to help make our dream a reality. Thanks so much! This weekend, we traveled to frigid Greenwich, Conn. to get our first taste of cold weather sailing at the I-420 Atlantic Coast Championship. Despite the challenging conditions and a few sailing errors, we gleaned many lessons this weekend and gained a lot from the three-day trip. After a long redeye Thursday night, we arrived in Connecticut for a training day. We were working with LISOT, the premier I-420 sailing team in the US, and renowned coach Steve Keen. Our practice day consisted of light air boathandling in front of the club with a small group of two other boats. The cold, light air day helped us acclimate to the frigid environment. We were fortunate to be staying with my aunt Donna, and her hospitality was much appreciated. The first day of racing, we were greeted with 50+ knot winds, rain, and flooding. We spent much of the day inside until racing was cancelled. However, we learned the importance of taking a minute during postponement to go into race mode and look at the course. While relaxation time is important, it is crucial to “check in” mentally and stay focused in case we are sent out. While we didn’t sail Saturday, we still learned critical lessons. Sunday brought a strong southwesterly breeze and more chilly conditions. The race committe was attempting to squeeze in as many races as possible to make up for our layday, so Sunday would be a long and tiring race day. We sailed out past the Capitan islands early, tuning up on the racecourse in the 14-18 knot breeze. Our first start was at the pin, but we were OCS and did not take the cross on the fleet that we should have. We finished in 11th, which was an improvement over last year’s score, but unfortunately it didn’t count toward our scoreline. The second race was a boat start, and we rounded the top mark in first! We lost two boats on the next upwind due to a poor bottom gate choice, but still finished in a respectable third place. Each subsequent race, we started near the boat, earning another OCS, but mostly top 10 scores. Despite the OCSs, we finished 14th of 28 boats, our best score in the fleet to date. We have a lot of things to work on. Our first taste of cold-weather sailing showed us our deficiency in winter gear. Coming from CA, we’ve never had to deal with freezing conditions, and shivering throughout the race day definitely detracted from our racing. We also learned that we need to focus more on nutrition. Without lots of food and fluids throughout the day, we won’t have the energy we need to race. Finally, our starts can be more conservative, as letter scores severely harm our scoreline. Overall, ACCs was a great learning experience and has boosted our confidence for Orange Bowl, our next event. If you would like to help us get there, we would appreciate a donation! We just won C420 Pacific Coast Championships in Cabrillo Beach, California! It was a two day regatta and the wind was great! We got a couple reach legs in and it was a good regatta. Our hard work is starting to pay off! We’ll keep you posted on what happens at the next few regattas. Our next I420 regatta is I420 Atlantic Coast Championship and we get back on the water for practice soon! We have finished the 2018 I420 World Championship!!!! We were not able to reach our goal of making gold fleet after a bad day of racing on the last qualifying day. Things were going well in silver fleet until the last day, when dropped from 2nd to 6th after our second yellow flag. It was a great event and a good experience for both of us. We are excited to keep practicing and raising money for the next year’s regattas.